Tuinis 'Ted' 1935-2005 70yo (cancer) never m.
Uilke enjoyed participating in the Recitation Society. He would memorize either serious (earnst) or light-hearted (luim) essays and present them in public, striving to present in the most effective way<!- in late 1990s, Stan and Jane still had a tobacco plate (tabak-pot) which Uilke had won by his participation in this club ->. He especially enjoyed the more serious essays, which often related to religious and/or theological matters. The name and motto of the club is "Rec. Club. Discendo Discimius", which means "through study, we learn". One essay that Uilke did was called "The Swimmer". Another was called "The Weathervane" which explained how they were able to place the weathervane on the very top of the church, with the help of a very big man who selflessly helped them to do it even though it cost him alot of pain (as the solder dripped down onto him). 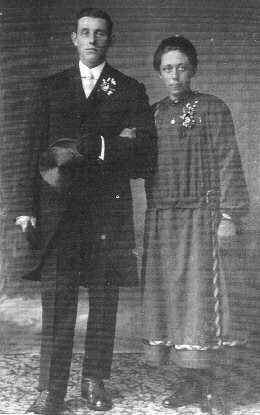 Uilke married Ietje NIJDAM 28 May 1925 in Sneek. 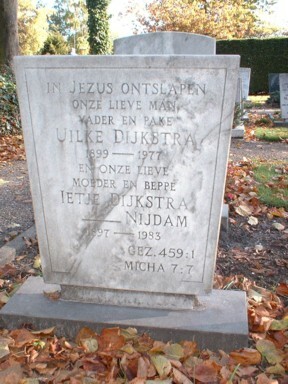 They moved to a dairy farm near Andijk 12 May 1928. He joined his brother Lolke and his parents who also lived in Andijk. Lolke had moved there at age 16 on 22 June 1912 and later became a market gardener. Uilke's parents had moved there 3 May 1927 after selling the Oosthem farm and all that belonged to it to Klaas van der Zee and Johantje Dijkstra (a relative, see XI-C-5 in book). His oldest son remembers that Uilke had decided at one point to move his family to Canada (Houston, BC). He had arranged to sell his Andijk farm, but at the last minute the buyer backed out of the deal. Just after this, WWII broke out. Besides being a dairy farmer, Uilke served in the local Gerevormeerde (Calvinistic) church as elder. The above picture was taken 10-4-1991 at a 'Chinese' (Indonesian food served by staff speaking charmingly accented Frisian) restaurant at ? (in or near Langalille where Ida lived at her farmhouse). Pictured are Jane, Ida, Irene, Stan, Sietze SNIJDER and Ulrick. We were saddened to hear of Ida's d. Tu 5-16-17. 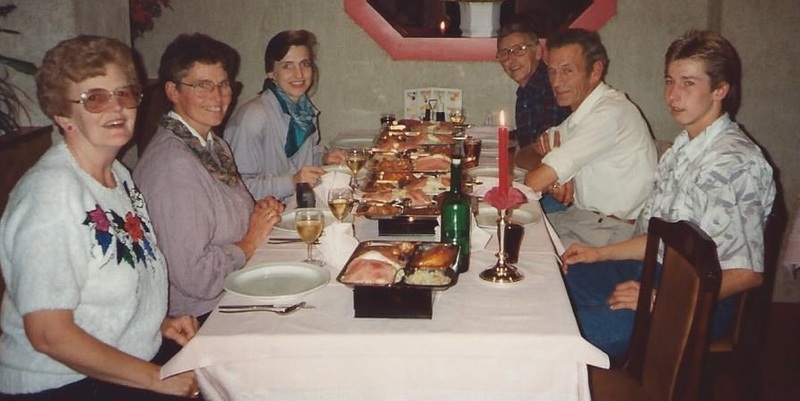 Irene visited Piet and Ida when she was a teenager, remembering her as hospitable, kind, thinking of others before herself, cheerful, enjoying laughter and having fun. Both Ida and Nely came to our Aug 1983 wedding in Port Alberni, BC. We visited her together (w/D&M D) in Oct 1991, driving from Munich and staying w/her for a week. We met all 4 of her kids, the youngest (18yo Ulrick) still living at home. We visited Petra and hubby Meine SNIJDER at their interesting mechanized dairy farm. Meine's dad Sietze (in above pic) was 'courting' Ida at the time. We also visited Agnes and Jan HEIDE at their home in the city of name? (probably Lemmer or Sneek, near Langalille). Jan was at work but we enjoyed chatting w/her. Irma and hubby lived nearby. I also remember Ida was very friendly and hospitable, laughing often. She served us lots of great cheese! Their farmhouse was (like the DYKSTRA one in Andijk, which we also visited) large enough to include both living quarters for the people and also (just behind the kitchen wall) the cows and other animals. Sadly, Ida suffered a major stroke yr (c2006?) and was unable to live independently, so was moved into a special care facility in (same town as Agnes?). She remained there til her d. at 75yo (b. 12-12-41), at which point her daughter reported she looked very bad and couldn't recognize anyone, a very sad end for a very nice lady. But we are thankful her struggles are over and she now enjoys the glory of God's presence.